Today I want to talk about a movie that you probably haven’t heard of, a documentary called Exit Through the Gift Shop. A movie that you need to see. The movie consists of a decent amount of footage from a French guy named Tierry who decides to document the secret subculture of street artists (think graffiti, but in painting form instead of giant signatures). He descends deeper and deeper into this culture until he decides to join it himself. Exit is both horrifying and fascinating. It’s horrifying because it’s about people who deface public property. It’s tough for me to watch people do that. But it’s fascinating because I came into this movie knowing absolutely nothing about this subculture. Plus, some of the art is beautiful and provocative. You can do things with street art that you can’t do on canvas, as you can see on the example here. By far the most talented of these artists is a guy named Banksy. When the movie started showing his work, I was absolutely riveted. 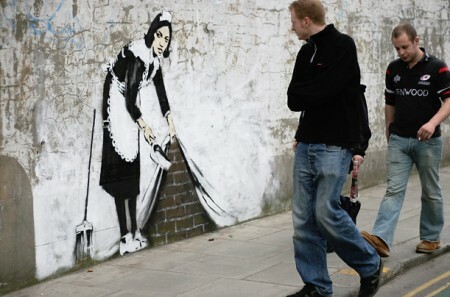 Plus, Banksy, the most famous of the street artists, is an enigma. His face and voice remain shrouded in mystery throughout the movie. I wonder how long this guy has kept up the mystery. His story reminds me a bit of the lifelong magic trick pulled by Christian Bale in The Prestige. I highly, highly recommend this movie. It’s escapism at its most informative. This entry was posted on Tuesday, January 4th, 2011 at 10:59 pm	and is filed under movies and tagged with personal. You can follow any responses to this entry through the RSS 2.0 feed. I’ve heard great things about both. They’re each on my list of movies I want to see, but I just got around to watching “Inception” last night, so it might be a while! Have you seen “Winter’s Bone” yet? Very disturbing and heartbreaking, but an excellent movie. As someone who grew up in rural Missouri, I can confirm that it was a little too accurate. I wasn’t nearly as rural or poor as the characters in the movie (I refer to my hometown as the “metropolis of northeastern Missouri”), but I could see a lot of similarities to people that I’ve met or grown up with. Go rent it if you have the chance–I highly recommend it. I’m glad you recommended Winter’s Bone. I’ve gone back and forth about it–I’ve read really positive reviews, and I’ve read reviews that admire the acting and setting but indicate that it’s pretty boring. I’ll take your word for it and add it to my queue. I can see that some people might think it’s boring because there’s not a lot of “action” that takes place–there aren’t any shootouts or car chases. But there are, in my opinion, some extremely tense and truthful moments that were more thrilling to me than most action movies. It’s not a film to rent if you’re looking to escape from reality for a while, but I wouldn’t discount it just because of that. I could also see some very urban people who’ve never experienced small town life being unable to relate to certain things that happen. Ouch, that was a little harsh! I think she was a great main character, but might be viewed as inaccessible because she isn’t able to act like a typical teenager since she is responsible for her family. She’s become hardened by her environment, but you see her vunerability slip through sometimes despite her actions. Most of the movie is about her being threatened directly and indirectly about pursuing her father’s whereabouts, but she has to continue anyway because she doesn’t have any other choice. She doesn’t just roam from house to house–she gets the crap kicked out of her, threatened with death over and over, and saved by someone who might end up killing her anyway. wow, that sounds tough to watch! But I’m looking forward to it. Thanks for the recommendation. My review stands even if the movie is fake–it’s a fascinating glimpse into the world of street art, as well as an inside look at this character named Banksy. It’s a must-watch movie. “Winter’s Bone” is fantastic, if depressing. Also all too realistic, I’m afraid. As for “Gift Shop”, I caught some of this over the holidays, and I was intrigued. It’s my understanding that it’s something of a hoax, however. Not that that makes it any less of a film. Another plug for Winter’s Bone…it’s rapidly moving up my Netflix queue. The movie was so good, I read the book immediately after. Also hard-hitting and maybe *slightly* less of a downer. The plugs keep getting better and better. After you watched the movie, did your food taste better? Did animated birds perch on your shoulder and sing songs by request? Did you discover that you have a tree in your background that bears money and chocolate? Who told you about my GD tree? You better sing, canary.